Yes, it’s been more than seven years since Trisha Yearwood has released a proper single. Yes, it was worth the wait. 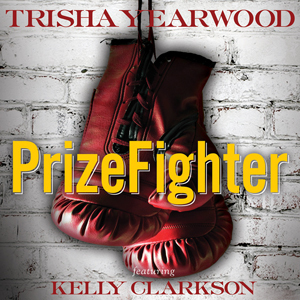 “Prize Fighter” is uplifting, inspirational, and powerful. It showcases Yearwood’s still flawless voice, an instrument that is effective at every setting between whisper and shout, and is always properly calibrated to the material it delivers. It’s a credit to Kelly Clarkson that she can even keep up with Yearwood, and her contributions to the track are complementary, if not entirely necessary. As for the song, I’m pretty sure it’s great. I say “pretty sure” only because it’s Yearwood singing it. She’s so good at what she does – so, so good – that she can make a good song sound great. Is this song more insightful in the end than similar go get ’em anthems because of Yearwood’s legendary taste in material, or her legendary skills as an interpreter of material? Would it sound less profound sung by Jo Dee Messina or Martina McBride? Certainly. But would Yearwood ever go near some of their mediocre anthem songs in the first place? Certainly not. For me, “Prize Fighter” is holding up well after dozens of listens and still sounds great when put up against her best singles and tracks. As usual, Garth Fundis scales the production perfectly, and things get more intense without getting more loud. Maybe we can get Yearwood to head up A&R and Fundis to be an in-house producer, and they can show the new generation how it’s supposed to be done. Because even twenty-three years after she first came on the scene, she’s still in a class all by herself. Prize fighter, indeed. It’s certainly good to see and hear Trisha back after seven years away from the studio mic, busy as she had been with her TV cooking shows and cookbooks. Given that it has been as long as it has for Trisha, though, one wonders, even with this good pairing between her and Kelly, whether this song will even be given a fair hearing on country radio, given how much they’re still attracted to the parisitical “bro country” movement. But other things have happened to her in this time. She lost her mom to breast cancer back in 2011, which was of course a devastating family blow to her. And earlier this year, in an interview, she also mentioned how much of a blow it was to her professionally to have heard about her spiritual role model Linda Ronstadt losing her voice to Parkinson’s (since she never made a secret out of wanting to do at least one song with Linda). She really wants back in, it seems to me; and hopefully, this song will get the kind of airplay I think it warrants, regardless of whether it sounds country or pop. For being such a big Yearwood fan, I still don’t own this song, therefore have only heard it once or twice. It’s not been on the radio at all, they yanked any audio of the single off YouTube and I really have had no desire to deal with GhostTunes yet. Not sure why I am having such a lack of motivation. The idea of being told to purchase a whole album filled mostly with songs I already own just for a few new ones did not sit well with me. You need an account, but it’s free. RE Cory’s comment, here’s mine from a few weeks ago on E145: “Am I correct in assuming that Trisha’s longtime fans, who already have all of her hits, will not be able to buy only the new songs on GhostTunes or anywhere else? My wife, also a big Trisha fan, expressed her displeasure on Trisha’s facebook. On Hal Ketchum’s new album, “I’m the Troubadour”, he has new versions of 3 or 4 old songs of his but the album does include 11 new songs, all for $9.99. I don’t follow his career closely enough, but am I correct in assuming this is a ‘Garth Brooks Move’? Trisha has always put such pride and integrity in her work that’s why this move puzzling to me. Even with “Songbook” A Collection of Hits” it wasn’t just a hits package tossed together with her biggest songs. It had a flow and it was carefully laid out for a smooth and enjoyable listening experience. This looks like something just tossed together to try and attract some first time fans who may be discovering her at the shows. Now with screwing fans over aside, GhostTunes is just a foolish marketing move on her teams part. She does not have the popularity at this point in her career to attract people to some brand new exclusive music application. Regardless of who she is married to. I am surprised that the woman who walked away from Garth Brooks management team in 1991 to stand out on her own with Ken Kragem is being dragged around by some coattails here 23 years and 12 million albums later. It’s disappointing. I think it’s fair to blame Garth’s influence here to a point, for sure, but even Garth is releasing a full album’s worth of music and not just a greatest hits with some new songs. As much as I’d like to blame somebody else for what’s happening here, I also think that she’s got to be held responsible, as far as it seems that she’s a strong woman who wouldn’t do something that she didn’t want to do. And as much as Garth is an egomaniac (and I say that with love, since I’m a pretty big fan of his), I don’t get the impression that he leads her around and calls the shots in their life or in her career. I get the impression that he respects her talent and that she gets final say in her career choices. Of course, this is just me speculating and projecting. I think it’s fair to blame Garth’s influence here to a point, for sure, but even Garth is releasing a full album’s worth of music and not just a greatest hits with some new songs. As much as I’d like to blame somebody else for what’s happening here, I also think that she’s got to be held responsible, as far as it seems that she’s a strong woman who wouldn’t do something that she didn’t want to do. Now that I think about it, even though I do still like “Prize Fighter”, these are valid points, especially when it comes to the album of hers that will be coming out. I really am not wild about the idea of her putting out an album where only six of the songs, including the title track, are brand new, and everything else was all previously released. She’s been one of the few mainstream country artists I’d listen to, but this is almost…God, how I hate to use this word…it’s almost downright lazy of her to do this. I agree Leeann, I don’t feel anyone but her is making the decisions here, it’s just disappointing the Garth-esque direction she is independently taking it in. I maintain that the only thing that seems to be Garth’s influence here is the Ghosttunes thing. That’s annoying to me, but not nearly as annoying as the lac of a full album of new music after all this time. I should say that I do like this song. The reason she re-recorded her old hits is so she will now own those masters; it was part of her deal with signing to the Sony group. She did this so MCA can’t repackage her old stuff and release it against her as they did with Jasper County, hurting her sales. bll – Does her old label now own the masters of her original recordings of those songs? I don’t see what would prevent bll from releasing their own hits sets or whatever. I was thinking the same thing. Is it that they couldn’t do it or that they likely wouldn’t find it worthwhile to do it now that she’s rerecorded some of her hits? These aren’t re-recordings, it is only digitally remastered versions. I’m so confused about that. To me, they do sound like they’re remastered versions of the original recordings, but more than one person has told me that they’re rerecordings. If she doesn’t own her own masters, how is she including them on this album though? Glad you liked Trisha’s song but was it necessary to bash Jo Dee and Martina in your review. I’m late to this discussion, but this an amazing song. It’s really terrific. And as always, Kevin, I love your reviews and writing. Thanks for the All Access link, Markus. Please let this be a hit. It deserves to be. Just great. Country. Hip. Beautiful vocals. Empowering yet not cheesy. There is no reason why this should not be a huge hit. I can’t imagine what justification radio people could give for not spinning this heavily. And I must admit, I have not purchased an album or song in over five years. Instead, I listen via Rhapsody commercial free with my monthly account. It is an honest purchase in which I pay for a service that record companies have agreed to. I listen to so much music, and I wonder how my fourteen bucks a month can possibly ever account for the amount of music I am listening to. It can’t. I love having this jukebox in my pocket for four fourteen dollars. However, I do not see how this is a sustainable model. According to Billboard, streaming has overtaken downloads and will continue to do so. Great job by Trisha singing the National Anthem at the opening of he World Series a few minutes ago. I finally gave in and pre-ordered the album on GhostTunes. I have no idea what’s up with these ‘remastered’ singles. I do not think the versions of “She’s In Love with the Boy” and “How Do I Live” sound very good. I think they actually sound pretty cheap. The vocals are empty and the arrangement is almost karaoke sounding….I mean as karaoke as you can get with a voice like Trisha Yearwood’s…..I am just not pleased with any of these recent happenings. But maybe I am just becoming a grumpy old muppet…. Haven’t heard this song yet, but the review and comments have peaked my interest. Will have to take a listen. I know some people have attitude about the album only having 6 new songs. But Trisha doesn’t just pick any song and the few she did pick are better than a 100 songs from any other artist. I Remember you is enough reason alone to own the whole thing. As for the re – records they are a nice new way to hear the old classics and to show new fans what she is all about. You can now sample some of the new songs on ghost tunes !